We went as far North as Mandalay. 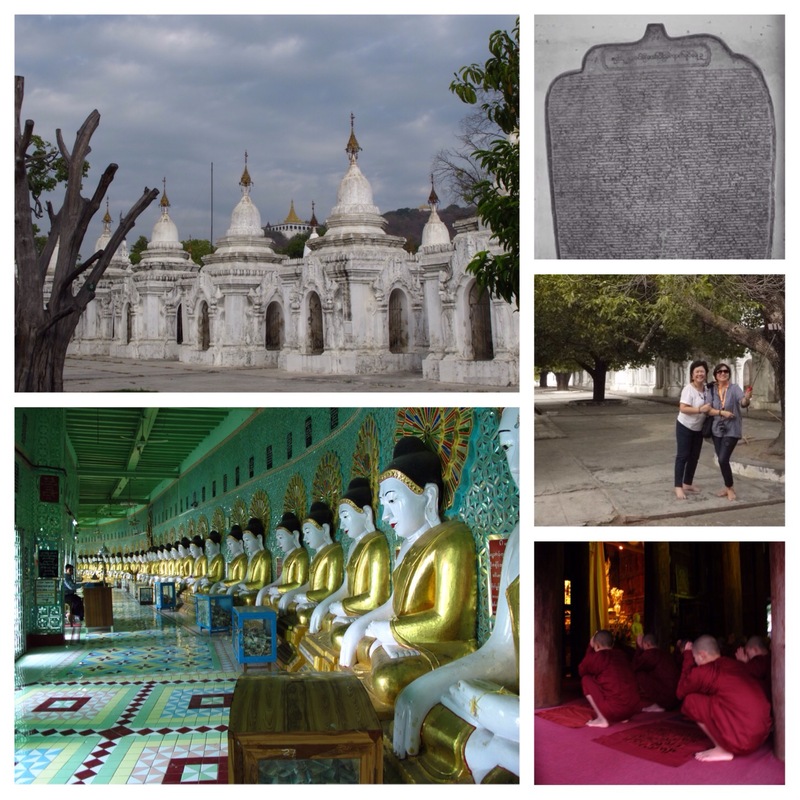 Known as the Golden City with its many pagodas and monasteries. 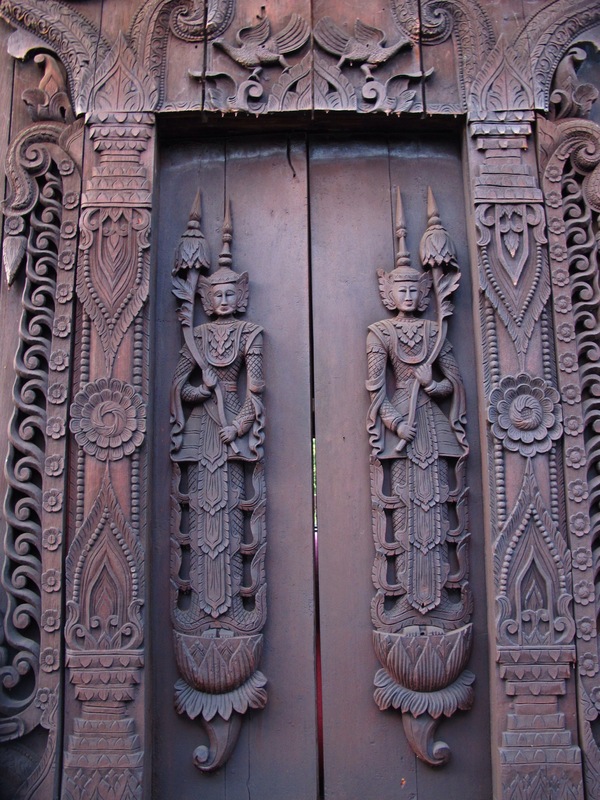 It was the capital of Burma (now Myanmar) before it was colonized by the British in the 1880’s. Rudyard Kipling’s poem entitled Road to Mandalay may have romanticized this former capital of Myanmar. 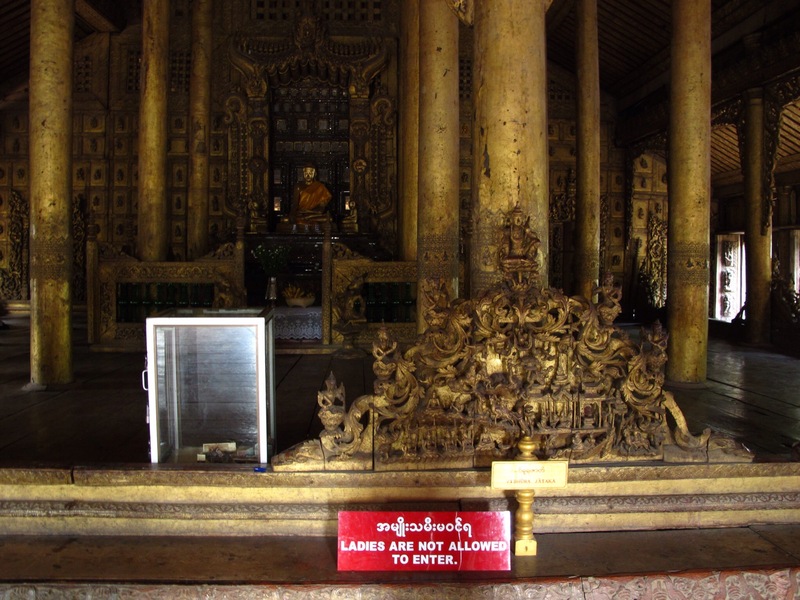 Rightly so, as it remains a religious center, the very heart of Buddhist Burma. 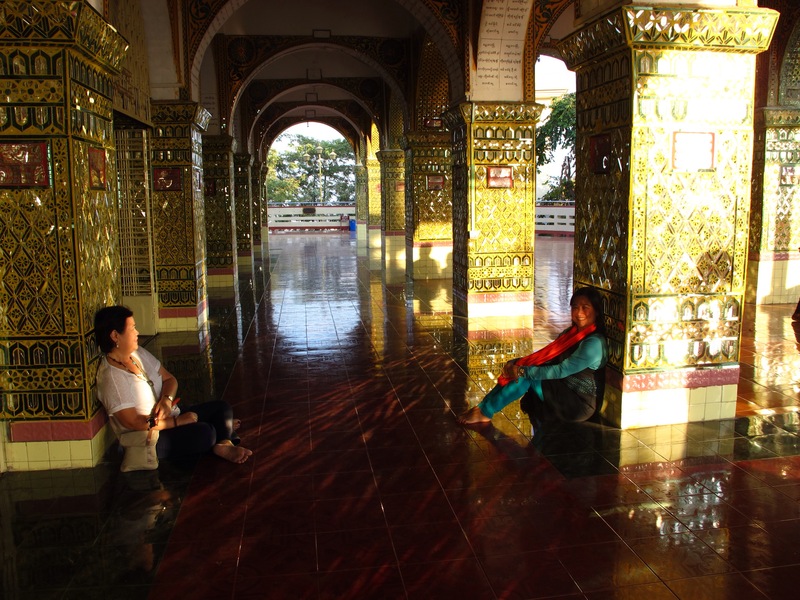 Among Mandalay’s religious monuments is Kuthodaw Pagoda where the world’s largest book is enshrined. 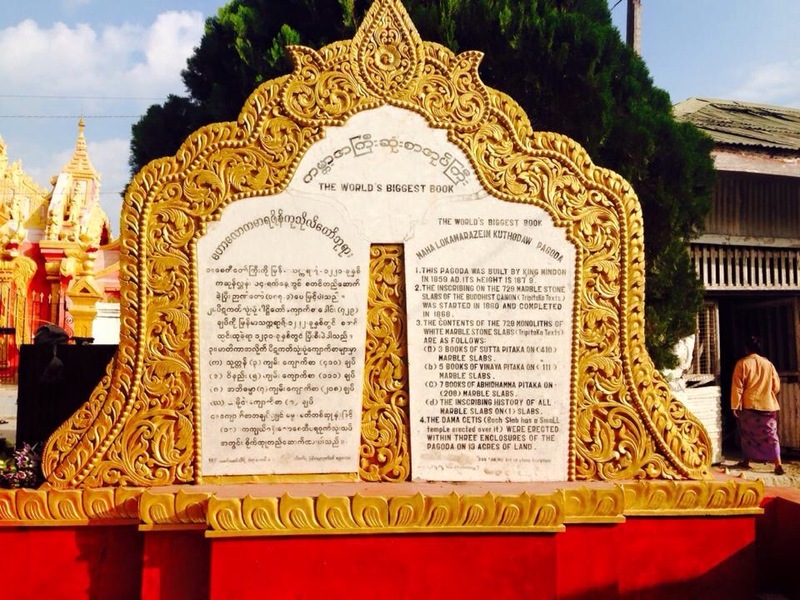 Inscribed on stone tablets are excerpts from the tipitaka or Buddhist scriptures. 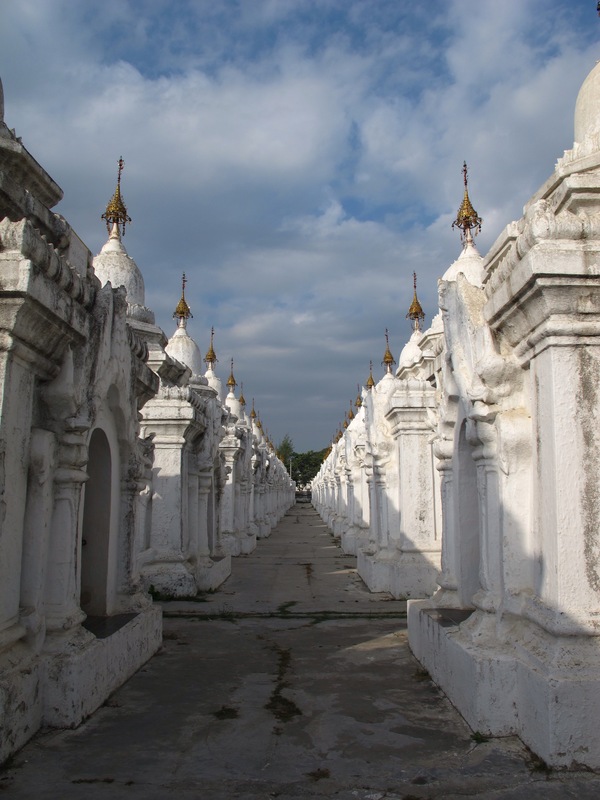 Each stone tablet is housed in each of the 729 white stupas surrounding a golden temple inspired by Bagan’s Shwezigon Pagoda. Star flower Trees planted between rows of white stupas provide ample shade and tons of charm for this pagoda complex. 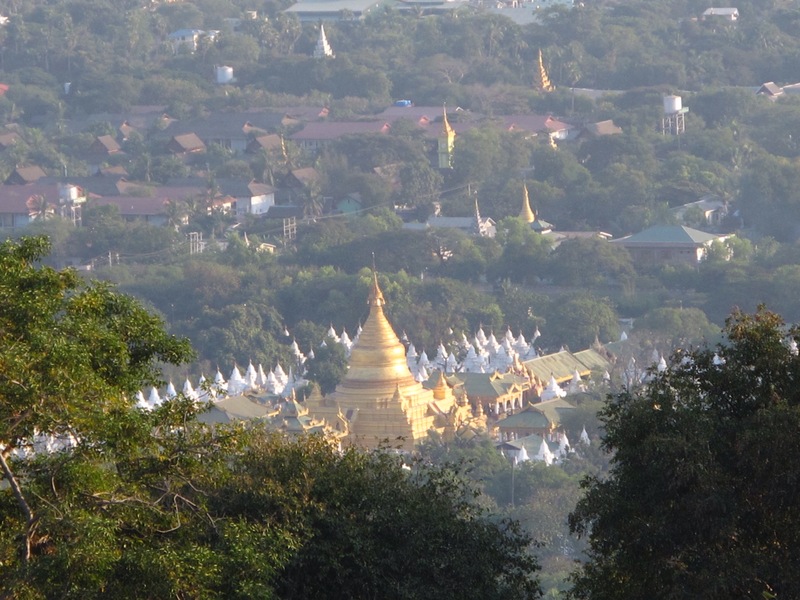 Kuthodaw glistens in its goldness both from the ground as well as when viewed high up in Mandalay Hill. 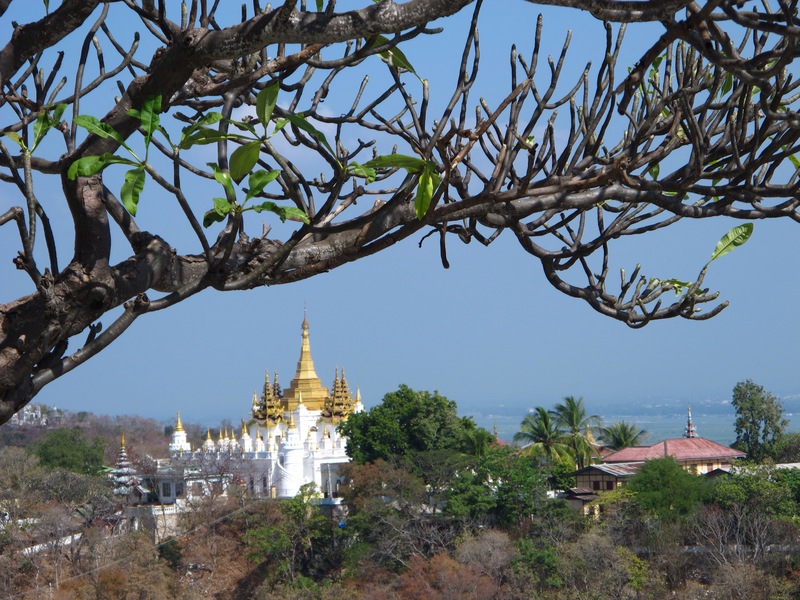 Speaking of Mandalay Hill, one may choose to climb it by hiking up, or go easy by taking an elevator to take you up in Sutaungpyei Pagoda from where one gets a panoramic view of Mandalay. A monk’s life involves a lot of discipline and silence. 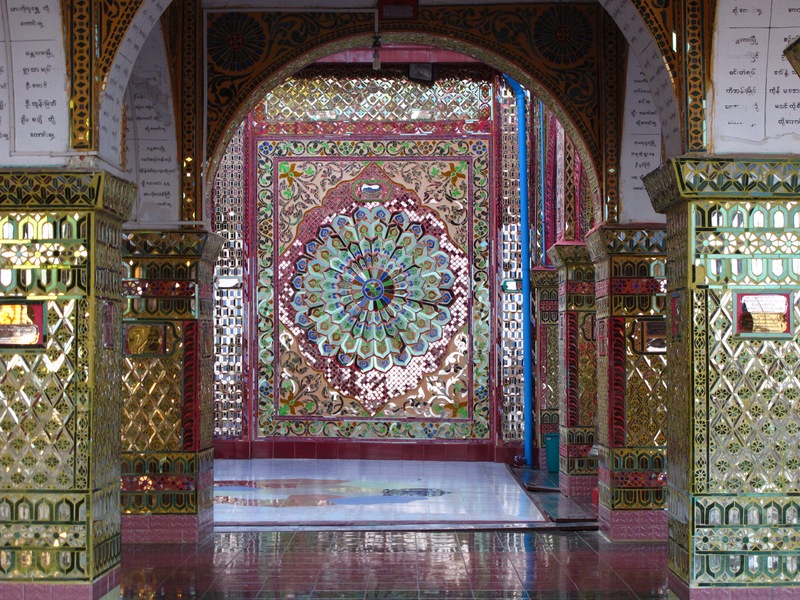 Here in Mandalay lie many monasteries and monastic schools like Maha Ganayon Kyaung where visitors can witness the monks’ rituals like lining up for their midday meals or doing their late afternoon prayer ceremony. All that chanting, bowing and meditating comprise the prayer ceremony we had the fortune to witness. For a moment there, I thought I’ve had enough of temples and monasteries so early in my trip. 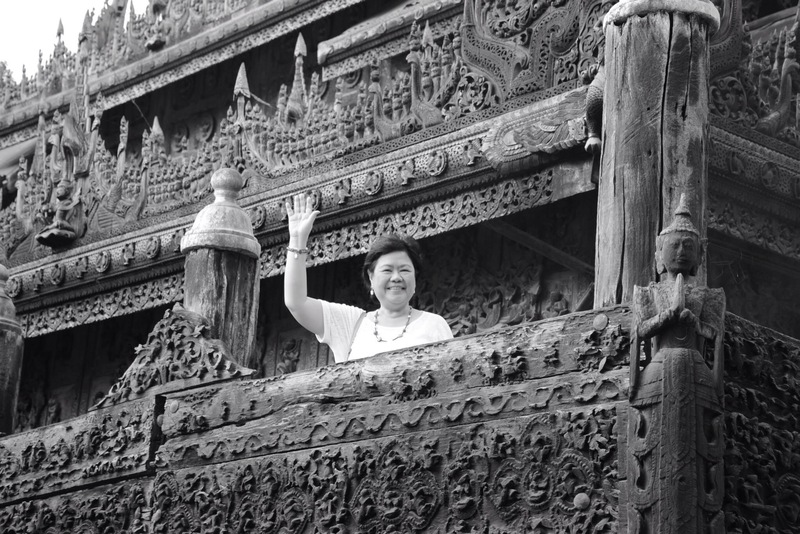 But what fascinated me are Myanmar’s landmarks in teak wood. 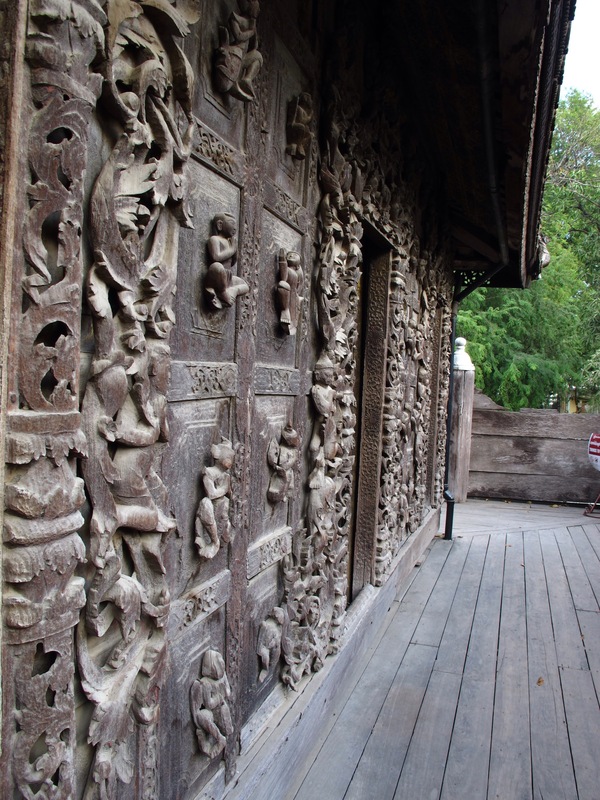 The country is the world’s top producer of teak wood and the Golden Palace Monastery or Shwenandaw Monastery is one fine example of Burmese architecture. As the last royal capital before the country was colonized by the British, Shenandaw happens to be King Mindon’s last royal palace. It’s just curious that the most sacred area within the monastery is exclusive to men. 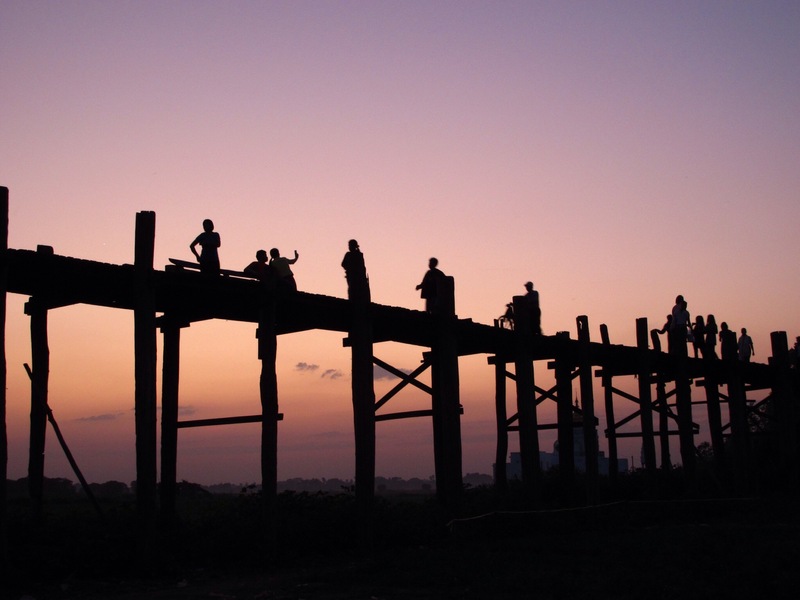 Last but not the least is one of Malanday’s iconic landmarks — this 1850-built bridge is touted as the oldest and longest teak bridge in the world to be found in the former capital of Amarapura. 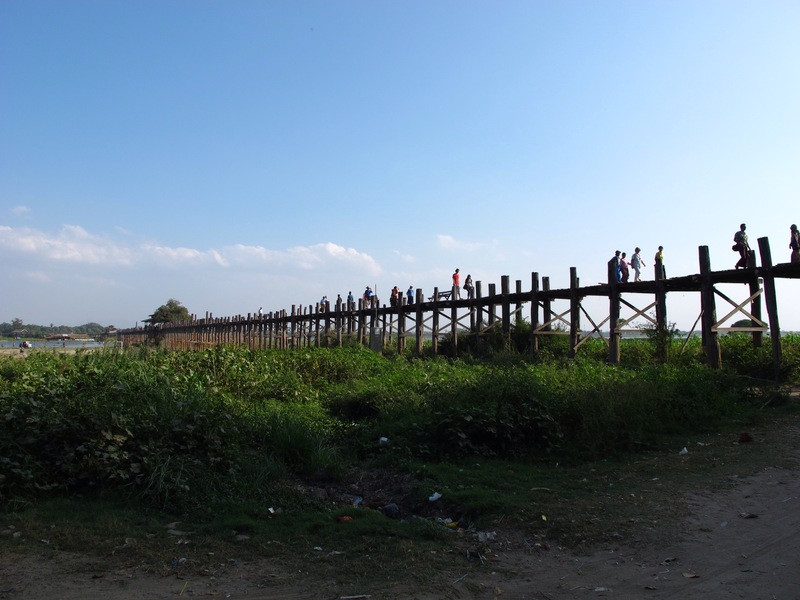 The bridge was built from wood reclaimed from the former ancient royal palace in Inwa or Ava. It doesn’t look much during the day, but its mosquito-infested location is perfect for sunset shots. With patience and a not so few mosquito bites, one can have a good snapshot of the teak bridge wrapped in the red orange warmth of a setting sun with monks, cyclists, basket-carrying women crossing the bridge, and likely tourists taking selfie shots. With a better cam, the silhouettes should make for a dramatic shot. It is only fitting I end this piece with a few lines from the poem penned by Kipling.